Art Finley born in West Virginia began his radio career at KXYZ/Houston, Texas, in 1944. Many Bay Area residents would get their first look at Art Finley in his guise as "Mayor Art," a popular children's program on KRON-TV (Channel 4) that first went on the air in 1958. Born Arthur Fingers, he also worked at KSFO/560 and had two separate stints at KGO/81 — sandwiched around moves to Vancouver, B.C., where he hosted shows on CHQM and CKNW. Mr. Finley later worked at KCBS Newsradio 74, hosting the "Nightbeat" call-in programming from 1990-1991. After his retirement from broadcasting in 1994, he took up residence near Vancouver. His "Art's Gallery," which combined a classic woodcut image with a clever caption written by Mr. Finley, was a popular weekly feature in the San Francisco Chronicle and other newspapers across the country. Art Finley (born 1926 in Fairmont, West Virginia, USA) was a North American television and radio personality, mostly in San Francisco and Vancouver, until his retirement in 1994. His broadcasting career began at KXYZ Houston in 1944. During the Korean War, he helped establish radio stations in Newfoundland for the United States military. Afterward, he worked in New York City. He is fondly remembered as "Mayor Art," the host of an afterschool children's show that aired weekday afternoons on KRON-TV in San Francisco beginning in 1958. * Dressed in a top hat and tails, he addressed his live audience of attendant children, who also wore top hats (with their first names written on them), as the "city council." * The hour-long show (eventually reduced to a half hour) was largely filled by animated cartoons featuring Popeye, Q. T. Hush, The Funny Company, and others. Cartoon segments often were introduced by a rousing cry from everybody of "Blooey, blooey!" * Live segments included Ring-a-Ding, a sock puppet that slightly resembled the Shari Lewis puppet Wing Ding and lived inside a cuckoo clock. * His standard greeting was, "A glass of milk and a how-do-you-do." He could always get a cheap laugh from the kids by "accidentally" mispronouncing his own name as "Mayor Nut." His standard closing was, "We'll be seeing you...subsequently." * Mayor Art sometimes made live appearances at county fairs in the Bay Area. * The Mayor Art character was partly a way of introducing young people to civic matters, which, in retrospect, revealed Finley's true interests and foreshadowed his later career as a radio talk show host. During the summer of 1966, Finley, no longer Mayor Art, as himself briefly hosted Pick a Show, a simple low-budget afternoon game show designed to promote KRON's NBC prime time lineup. The game was played over the telephone; pictures representing NBC shows were arranged in rows of increasing length, and the at-home player had multiple chances to guess which picture in each row had a dollar amount under it. The San Francisco Chronicle published a weekly panel titled "Art's Gallery," consisting of an old woodcut pulled from the newspaper's archives, to which Finley had written a humorous modern-day caption. On February 12, 2002, Finley donated tapes of 100 interviews, culled from the above, to the Library of the University of British Columbia Rare Books and Special Collections. Jimmy Pattison buys Jack Webster away from CKNW with an offer of $110,000 per year. Jack returns to CJOR. With this change, Art Finley takes over for Jack on CKNW. 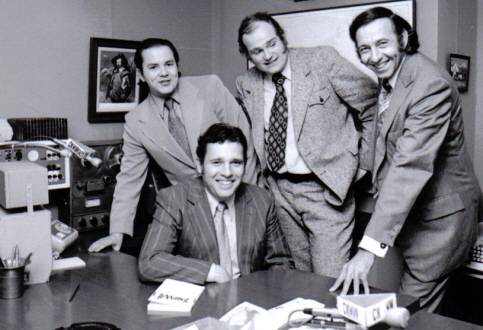 Newspaperman, Gary Bannerman, is welcomed by Ed Murphy, Terry Spence and Art Finley to "The Investigators".